It might sound like a myth to be debunked on Snopes, or the plot of a sequel to "Snakes on a Plane," but officers with the San Diego Department of Animal Services recently retrieved a 5-foot boa constrictor from a toilet. Dan DeSousa, deputy director of the San Diego Department of Animal Services, told The Dodo that in his 25 years of working with animals, it's the first time he's heard of one coming up out of a toilet. I ran out of the bathroom screaming louder than I'd like to admit and taped the door shut until the City of San Diego Animal Control arrived to wrangle the snake. The animal control officer said that she had never witnessed anything like this in her career. She referred to the incident as 'The Stuff of Urban Legends' and I would have to agree. This is every person's worst nightmare! Though some of us would object to the description of snakes as the stuff of "worst nightmares" (there are, in fact, people who have devoted their lives to saving giant snakes), the case is nevertheless a strange one. The building's landlord, according to Fox 5 San Diego, confirmed with Lacsa that the animal was likely a fellow tenant's pet gone missing. "We've all heard the story of alligators in the sewers," DeSousa said, "but we chalked that up to old wives' tales." 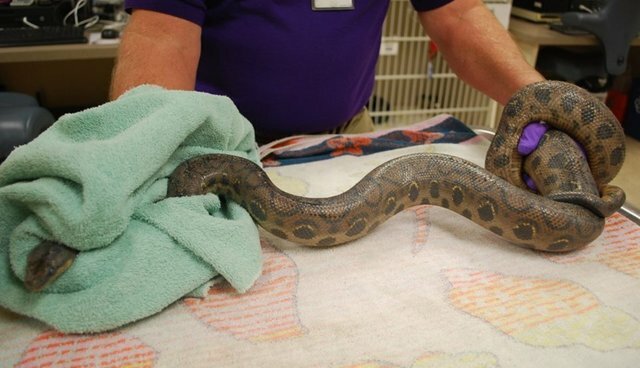 The boa constrictor spent a few days in the care of a veterinarian, until a friend of the snake's owner picked up the animal on Friday, DeSousa said. The owner of the toilet snake, perhaps unsurprisingly, has declined to come forward.